The Capture-ID™ mobile scanner is wireless, accurate, and reliable for digital capture of documents and identity information away from the desk. This saves time,improves productivity , and reduces the risk and cost of handling paper. Paralegals , insurance agents, realtors, and others can scan documents at their client's site when a copier is unavailable and take it with them immediately. Security, medical offices, hotel registration, public events (concerts, sports), and others can scan small-format personal identification such as business cards, drivers' licenses, passports, insurance cards, and notes that are difficult with a slide, wand, or sheet-feed style of scanner. Reliably and accurately captures documents while away from the desk. No computer is required to scan. 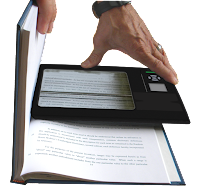 Scan-in-binding technology. Patent pending. Reduces the distortion and strain on the binding typical of copiers and other scanners by scanning close into the inside edge of a bound document or book.